Nudge Nudge Ink Ink: This is Why We Do This! I have had some lovely feedback recently that I want to share with you. 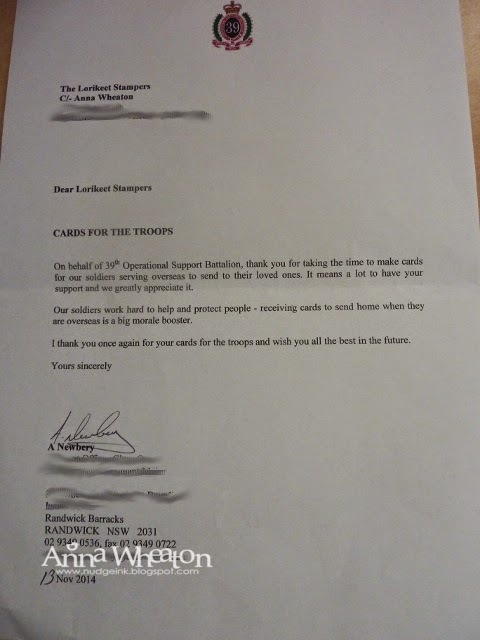 Firstly a letter from Randwick Barracks where we send our cards for distribution. On behalf of 39th Operational Support Battalion, thank you for taking the time to make cards for our soldiers serving overseas to send to their loved ones. It means a lot to have your support and we greatly appreciate it. Our soldiers work hard to help and protect people - receiving cards to send home when they are overseas is a big morale booster. On behalf of all the Royal Australian Navy members posted here in Bahrain at the present time, I would like to say a huge thank you for the Christmas cards we have received. We are very grateful to have people like yourself providing us with cards to send home, making communication at Christmas time that little bit easier. I'm a Leading Seaman Maritime Logistics - Supply Chain sailor in the Royal Australian Navy, I'm 25 years old and am currently posted to the Maritime Operations Support Group in Bahrain. My primary job role is stores and mail for the Australian Ship which is on operation at this time in the Middle East region. This involves receiving stores item and personal mail for ships company and organising freight drop offs to their next port of call, ensuring they receive their mail as soon as possible. From all of us here, We wish you a Merry Christmas and a safe and happy New Year. Thank you kindly for providing the footprint card packs. Ericka encourages parents to create the footprint card in the family room located in the Neonatal Intensive care Unit (NICU). This family room provides peace and privacy for recently bereaved parents. We believe that your cards have provided parents and families of sick babies and babies who have passed away with the opportunity to spend quality and private time with their babies and take a memory of their baby home with them. 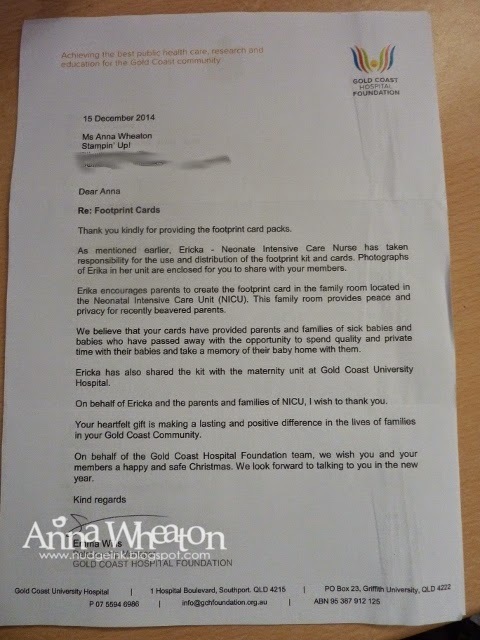 Ericka has also shared the kit with the maternity unit at Gold Coast University Hospital. On behalf of Ericka and the parents of NICU, I wish to thank you. So thank you to all my customers and team who have donated money, goods and time to these worthy causes. It's lovely that we have the opportunity to use what we love doing to help others. Let's do some more next year! This is what it is all about Sharing with others what we love doing. Thank you Anna for sharing these letters.